Recreation is more than just activity. It’s identity and often life-purpose. Restoring the ability to engage in a favourite recreation activity can have a profoundly positive effect on quality of life. TADWA has a long and proud history of developing innovative solutions to re-able recreation. Here are just a few recent projects as examples of what we can achieve. The WA Disabled Water Ski Club approached TADWA to help with the customisation of a water ski for a young client with Cerebral Palsy. Chris needed a lightweight ‘throwing chair’ to be able to compete in the sit-down Javelin event. 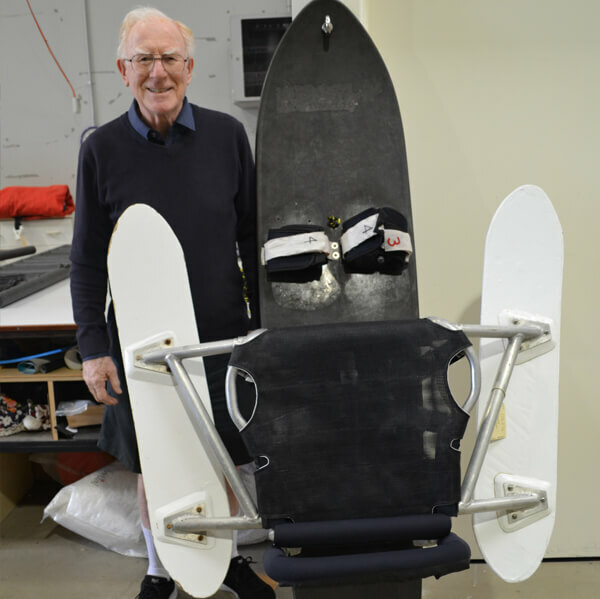 He turned to TADWA to engineer and construct the specialised chair which has now been used in national competition and to assist Chris in his preparation for the 2020 Paralympic Games. Adrian suffered a spinal cord injury in a mountain bike accident. It was important to him to restore as much upper-body strength as possible, but to do that he needed a customised weights apparatus he could access from his wheelchair. Several fittings and custom modifications later, Adrian had his gym and is now able to exercise effectively. When Cockburn Ice Arena wanted to introduce a regular “All Abilities” ice skating session, they approached TADWA to design and construct a special ‘ice chair’. The design brief was to have something that could easily be rolled onto the rink from the outside, so the occupant could be seated before entering the ice surface. 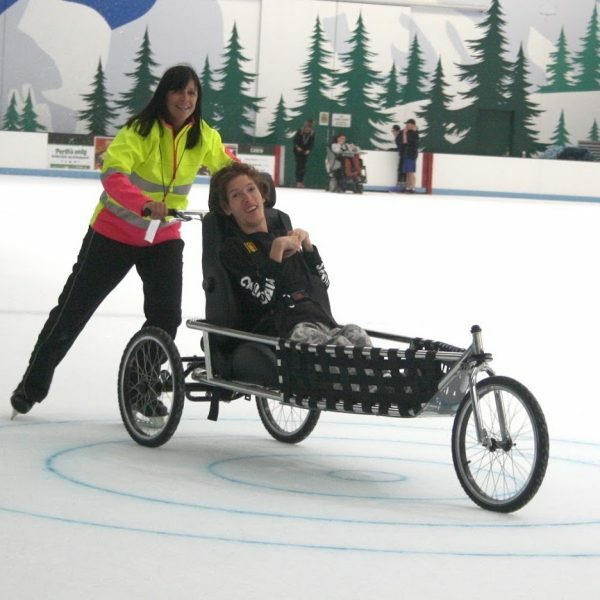 The TADWA Ice Chair uses studded tyres, and dual-braked attendant steering for controlled speed and steering on the ice. Through the specialised recreation program WADSA specifically targets people with severe and profound disabilities, of any age, who are often not engaged in activities within the community around the state. TADWA has developed a wide range of adaptive toys for WADSA, including switch-adapted remote control cars, FPV orientation glasses for wheelchair-bound participants, switch-adapted nerf guns and targets. We are currently developing a series of soccer robots, an electric bowling chute and a VR Treadmill! What was important to Gary, a tetraplegic following a workplace accident, was to be able to mow the lawn on his 14 acre Serpentine property. 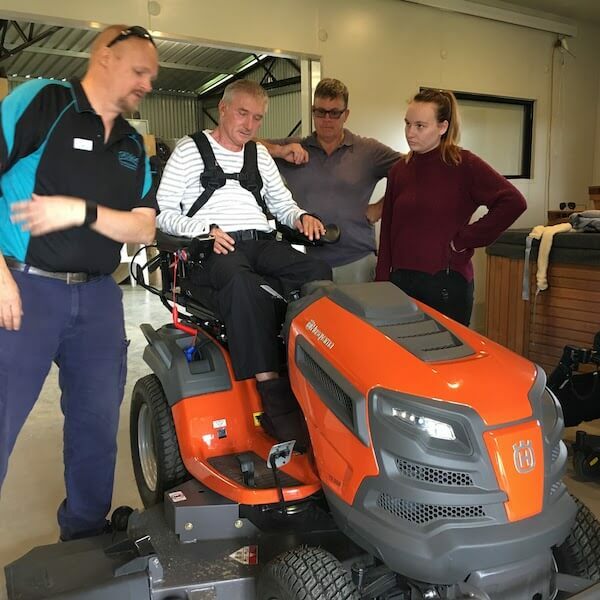 He commissioned TADWA to modify a Husqvarna ride-on lawnmower so that it could be entirely controlled by the same joystick mechanism Gary used on his electric wheelchair. This was a major undertaking, involving extensive research and development (including designing and manufacturing a custom circuit board to house the new electronic brain for the mower), as well as a fanatical attention to detail in the areas of functionality and occupant safety. Gary is now able to enjoy his property and have the satisfaction of maintaining his extensive lawn area.